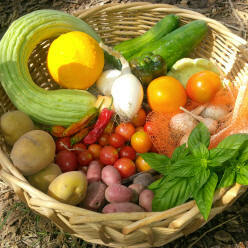 Get All of Your Organic Gardening and Farming Products Here! Non-Certified/Old Fashioned Organic Practices Used - We ♥ Our Soil! I'm still updating and fixing links - Sorry for the reconstruction dust. Thank you for your patience! Follow Eden's on , Twitter and our BLOGpages where you can keep up with Life on the Farm. And check in with my friend and colleage Beverly Thomas of Cold Springs Farm in Weatherford, the other half of Two Lady Farmers . Welcome to your Local, Home Town, Urban Farm! NO GMO & NO SYNTHETIC pesticides/herbicides or fertilizers. We're all natural, sustainable and REAL! Call me an unconventional farmer, but I like real food that is produced in a way that is sustainable to the farm it grew on. I want it free of GMO's and synthetic pesticides or herbicides and picked and sold within hours not weeks of harvest because it is grown and distributed close to home by folks I can get to know! If I wasn't growing it myself, I'd join a farm that did. You can shop at Market Day or join our CSA. But either way, you get Real Food, Grown with Integrity! Fresh, Real Food - Our food is not transported from clear across the country - or the world - to your table, so it tastes great! Kids, (and adults) will eat more vegetables if they taste good! And, when kids see where it comes from, they are more interested in their food, too. *Occasionally, we'll bring up unique foods from south Texas that can't really be grown en masse in North Texas, such as citrus. Nutritionally Dense Food - Because our food is grown in sustainable and organically enriched soils, (generally associated with small, family farms using natural methods or well managed certified organic operations), picked ripe, not "green", and not shipped and stored for months in a warehouse cooler, then gassed to make it look ripe and pretty). You get the many health benefits of fresh foods packed with vitamins and minerals that will nourish your body and mind! Plus, food grown to maturity yields tastier food than those picked too soon! Food Security - Know that your food is being grown safely, locally and by people who really care about you and what they are doing. Many small farmers tend to live on or near their land, which generally means they have a vested interest in the stewardship of their land. Keeping green-spaces green for future generations, enriches some of our local history, and also preserves a part of US history that everyone can enjoy in many ways. Plus, they and their families EAT what they grow! Face to Face - Shake the hand that feeds you! Be it at our on the farm farmer's market or through our CSA, getting to know who is growing your food is real peace of mind! You know your doctor, mechanic and dry cleaner - do you know your farmer? Know your farmer - Know your food! Local Economy Boost - Keep your food dollars circulating in your own community. Eden's does NOT supplement our market offerings or CSA shares with out-sourced foods. ALL of the food at Eden's is locally grown/produced by us or other local farmers/ranchers/producers who share our sustainable growing philosophies! So by purchasing food through Eden's, you are supporting fellow Texans! Convenience - Eden's Garden CSA Farm is located less than 15 miles southeast of downtown Dallas, 1 block off of I20 and 1 mile east of 635. We also have a weekly CSA delivery option for those living north in the Lakewood area. Gather up a group of friends from church or the neighborhood and additional drop sites may be added based on demand. While I don't use synthetic chemical pesticides & herbicides and instead, DO use natural and sustainable farming practices, take good care of my land, raise my animals with the utmost respect and care, treat those who help at the farm with respect and love, nurture the environment and do many things that would be considered "beyond organic"; the USDA has basically hijacked the word organic, so we use the word, Clean. A few ask if the farm is "certified" organic. There are actually laws saying a farm can not claim in any way to be organic or even say they are using "organic methods", unless they pay a fee to have a USDA inspector come out once a year, fill out a bunch of forms annually, pay a fee for each variety of crop grown and to have the farm re-inspected if there is a problem, keeping specific and detailed financial and harvest records for inspections every year. Like I don't have enough paperwork to do and bills to pay with the farm's IRS and growing records. No, I'm not kidding. I network with other farmers using these same growing principals and many of us belong to TOFGA, our state's only association of organic farmers, and other organizations that promote the "O word" way of growing. Many of us go beyond the USDA's ever-changing and relaxing "organic standards" anyway. Many of your smaller farms that are "clean" (and those who do jump through the hoops to be certified) are often going above and beyond those standards. Transparency - While I do have fences to keep horses in, and hopefully, predators out, this is a community oriented farm. Regularly planned activities keep the place hopping with visitors; you are our "inspectors", on a regular basis. Farm tours and other on-farm visit/use events are available, by reservation, so I can plan work - not so I can hide anything from you. And there are folks just like you, who volunteer to work side by side with me learning how I do things naturally here at Eden's, and eat the same food I do. Eden's has come to have a great reputation for being a leader in the organic gardening community for over 10 years. To me, it boils down to "know your farmer". I think this transparent policy directly with customers is a better way. I hope you do, too. It's my passion to grow and make available quality, nutrient dense and reasonablly priced foods for those in my community and those who choose to travel to Balch Springs to visit. It is also my desire to help others learn, and to learn from others, the best, most effective, efficient and sustainable methods for doing so. Join us soon!